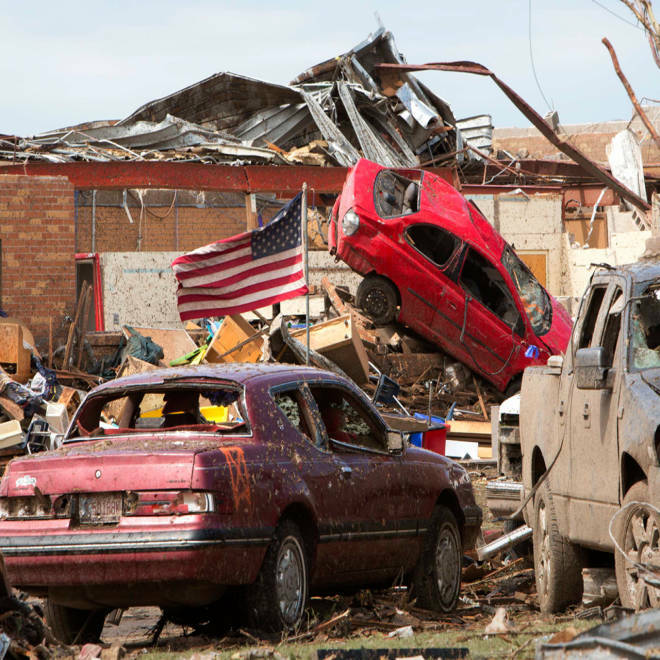 Destroyed vehicles lie in the rubble outside the Plaza Towers Elementary school in Moore, Okla., on Tuesday. 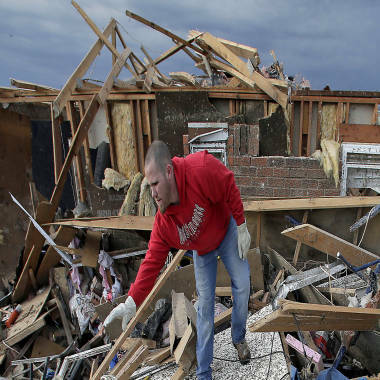 As evening drew to a close in Oklahoma, after a day of tireless searching for survivors among the debris left behind by a powerful tornado, officials said the operation could end by nightfall Tuesday. "We will be through every damaged piece of property in this city at least three times before we're done and we hope to be done by dark tonight," Moore Fire Chief Gary Bird said at a news conference. Emergency crews and National Guard troops picked through neighborhoods without recognizable streets in a grim, house-by-house search of the blasted-out husk of a city left behind by the ferocious tornado. Authorities lowered the death toll to 24, less than half the figure they gave in the initial chaos after the twister, but there was still no full accounting of those missing. Nine of the confirmed dead were children, including seven in a flattened elementary school. Four bodies were recovered, including a 3-month-old baby, at a local 7-Eleven. 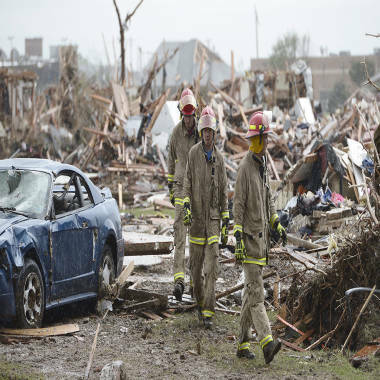 Working with search dogs and under menacing skies, the crews meticulously combed the rubble in the Oklahoma City suburb of Moore, which took a direct hit when the tornado cut a 17-mile path of destruction on Monday afternoon. Dozens of people were pulled from the wreckage in the initial hours after the storm, but there were no reports of additional survivors found Tuesday — only scraps of wood, shreds of clothing, shards of glass and metal and cars crumpled into each other and into buildings. Entire stretches of Moore looked as if they had been put through a blender. Gov. Mary Fallin said there were 237 injured, but authorities cautioned that figure and the death toll could still rise. Even with the benefit of a full day’s light, people were only beginning to grasp the scope of the destruction in Moore and parts of Oklahoma City. The Oklahoma University Medical Center admitted 59 children and 34 adults. The National Weather Service said survey crews had found at least one area of Category EF5 damage — the highest classification for tornadoes, meaning winds had exceeded 200 mph. Frank Keating, a former Oklahoma governor, said on MSNBC that as many as 20,000 families could be displaced. “This was the storm of storms,” Oklahoma City Mayor Mick Cornett said. The first of the victims was publicly identified — Ja’Nae Hornsby, a third-grader who was killed when the tornado demolished Plaza Towers Elementary School. She was remembered by her family Tuesday as full of joy and fond of playing dress-up. Her relatives gathered at a Baptist church in Oklahoma City to console each other. A second victim, Hemant Bhonde, 65, became separated from his wife when the tornado struck their home, his family told NBC News. Bhonde's body was recovered Tuesday, hospital officials said. His wife survived. Firefighters examine the rubble of a home in a destroyed neighborhood in Moore. As they took the measure of what they had lost, people in Moore also marveled that they were alive, and began to share stories of survival and of how they protected each other when the twister struck, announcing itself with roaring wind. Children from Plaza Towers Elementary School, where seven children were reported drowned in a pool of water, told of hearing sirens and running into a hall for cover, some still carrying their math books. A teacher, Rhonda Crosswhite, said she huddled with students in a bathroom stall and draped herself over them for cover as the storm hit. She said all her students were accounted for. Damian Britton, a fourth-grader, credited “Miss Crosswhite” with saving his life. He estimated it took about five minutes for the twister to pass through before the students emerged from cover to survey the damage and check on their classmates. At an afternoon news conference, Bird said that search dogs were no longer “making any hits” at the school. He said no one had been found there Tuesday but cautioned that the search was still active. “They will not declare that structure clear until they are down to the ground and have been through every piece of rubble in that building,” he said. One child was killed at Briarwood Elementary School, elsewhere in Moore, said police Sgt. Jeremy Lewis. There was no word on how the ninth child died. Besides the 19 deaths in Moore, five were killed in southern neighborhoods of Oklahoma City. Zac Woodcock salvages items from the rubble of a tornado-ravaged rental home in Moore. Authorities said they hoped to have every home, business and car in Moore searched by nightfall. They worked under the threat of still more severe weather. Forecasters said parts of Oklahoma and Texas, including Dallas, were at risk for more tornadoes. The tornado Monday spent 40 minutes on the ground, said Rick Smith of the National Weather Service. “We’ve seen numerous structures that are wiped clean to the foundation,” he said. Smith said that the first severe thunderstorm warning had gone out 44 minutes before the tornado touched down, and the first tornado warning 16 minutes ahead. The weather service said the storm, at its widest, stretched 1.3 miles. President Barack Obama called it “one of the most destructive tornadoes in history.” Speaking from the White House, he pledged the full help of the federal government and said there was no time to waste. Queen Elizabeth II extended her deepest sympathies, and House Speaker John Boehner ordered flags at the Capitol to half-staff. Relief efforts sprang up. The NBA’s Oklahoma City Thunder and its star player, Kevin Durant, each pledged $1 million. Others helped as they could: Miles from Moore, people went on Facebook to post family photos that had landed in their yards, hoping to match them with their owners. Aerial pictures of the destruction brought to mind Joplin, the Missouri town virtually wiped off the map two years ago when an EF5 tornado killed 158 people and caused $2.8 billion in damage. The twister cut a path similar to a tornado outbreak that ravaged Oklahoma and Kansas on May 3, 1999, killing 46 people and damaging or destroying more than 8,000 homes. Wind in that outbreak was clocked at 318 mph, the fastest ever recorded on earth. Officials in Moore complained earlier this year about foot-dragging by the federal government over $2 million in federal grants for “safe rooms” in 800 homes to protect them from severe weather. A spokesman for the Federal Emergency Management Agency told NBC News the agency was looking into the claim. The city’s website also said, however, that Moore faced only a 1 to 2 percent chance of a tornado on any spring day, and that if a tornado did strike, there was less than a 1 percent chance that it would be as strong as the 1999 tornado. Monday’s storm beat those odds. Alfredo Corrales and Viviana Lune rode it out in a shelter beneath their house. Corrales told TODAY that they had hunkered down there and heard voices above, and popped open the door to find several neighbors asking to come in. The wind was so strong, Corrales said, that he and a neighbor had to hold the cellar door shut. When they emerged, they found a rewritten landscape. NBC News' Jeff Black, Tracy Connor, Becky Bratu and Kristen Welker contributed to this report, as did NBC News contributor Alex Hannaford and The Associated Press.